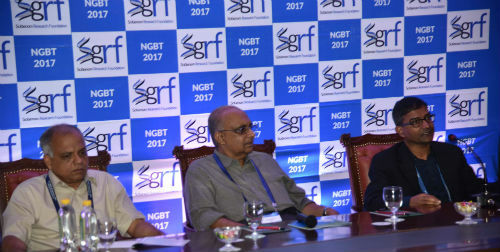 Bhubaneswar: SciGenom Research Foundation organized its seventh annual international conference titled “NextGen Genomics, Biology, Bioinformatics and Technologies (NGBT)” at Bhubaneswar, India during October 2nd – 4th, 2017. The co-hosts for this edition of the NGBT meeting included The Centre for the Commercialization of Antibodies and Biologics (CCAB); The Toronto Recombinant Antibody Centre (TRAC), Toronto, Canada; Institute of Bioinformatics (IOB), Bengaluru, India, National Institute of Science, Education and Research, Odisha, India and Kalinga Institute of Industrial Technology University (KIIT), Odisha, India. The Conference featured exciting developments in genomics technologies and their applications in life sciences including human, plant and animal biology, drug discovery, cancer immunology, genome engineering using CRISPR/CAS9, medical applications and personalized therapy. Featuring accomplished national and international speakers, thinkers and thought leaders that shape the course of scientific discovery, the Conference saw about 80 talks and 13 keynote lectures delivered. Speakers and delegates representing leading universities and research institutions from India and abroad were at the meeting. “We’ve always looked to this Conference as a platform that brings some of the best minds in research and innovation together. 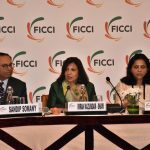 The speakers bring a world of information and knowledge with them and the Conference provides the perfect opportunity to all stakeholders to access this information and plan real change going forward. There have been many exciting developments in genomics technologies and their applications and this year’s Conference continues to be an eye opener to the possibilities that the field of Genomics can offer”, said Dr Sekar Seshagiri, NGBT Conference Chair. Genome Asia 100K served as Knowledge Partner for the Conference, which, as in the past, continued to be an ecosystem for scientists and students to share their work, build new connections and explore collaborations. The Canadian Journal of Biotechnology indexed the student abstract and sponsored the poster awards along with Genome Asia 100k. AllSeq and ETHealthworld were NGBT’s online media partners. The Conference also featured industry leaders from Illumina, MedGenome, Premas, Agrigenome, FeatherSoft, PacBio, ILS, Integrated DNA Technologies (IDT), Nanostring, Agena, New England BioLabs, MagGenome, KSIDC, Agilent and other leading organizations. At the meeting, SGRF presented the 2017 Lifetime Achievement Award to Dr Partha Majumder, NIBMG, Kalyani, India. Dr. K. Thangaraj, CCMB Hyderabad was awarded the 2017 SGRF Excellence in Science Award. They both have done pioneering work in the field of human genomics. SGRF awarded scholarships and travel awards to 140 students to enable their participation at the meeting. SGRF also announced the winners of its 2017 Genomics Project Grants at the meeting.